The nineteenth century witnessed many developments in the quest for education, but Mechanics’ Institutes are perhaps the least familiar. The industrial revolution highlighted the need for an educated workforce amongst the adult population as well as the child population, the future workers. George Birkbeck (1776-1841), who is commonly credited with founding the movement, was born at Settle in Yorkshire. In 1799, as Professor of Natural Philosphy at Anderson’s College, Glasgow, he delivered his first free lectures to the working classes. On becoming a physician in London in 1804, in collaboration with Scottish radicals Joseph Robertson and Henry Brougham, he advocated the establishment of reading and book clubs for working men, where lecturers would regularly attempt to broaden the knowledge of members. The London Mechanics’, (or Birkbeck), Institute was formed in 1824, later to become Birkbeck College, part of London University. However, George Birkbeck would probably have been the first to acknowledge that John Anderson, the founder of Anderson’s College, was the true originator of the principle of free lectures to mechanics by his establishment of bi-weekly classes from 1756-60 in Glasgow. 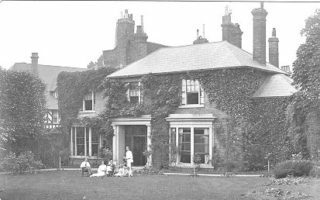 Nationally, and after a hesitant beginning, several isolated institutes or adult schools were established until, by 1815, twenty towns claimed such facilities. Rapid expansion took place and by 1850 there were 610 Institutes with over 100,000 members in existence. It would seem that Anderson’s original philosophy of solely lecturing to the working class was overtaken by the success of the venture, because by the middle of the 19th century the Institutes’ membership reflected a broader spectrum of society. This perhaps would indicate a measure of their success, for surely the ‘middle classes’ were essentially an educated workforce. 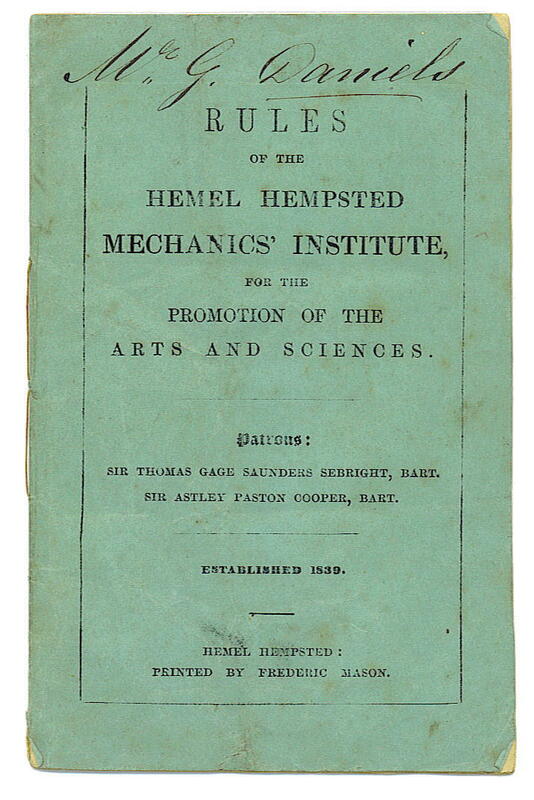 The Hemel Hempstead Mechanics’ Institute held its inaugural meeting on 26 March 1839, with J Sinclair in the chair, and Rev F H Gotch, Mr Cranstone, Mr Ogle, Mr Seymour, Mr Tyers, Mr H Bowen, J Steven and J Hales serving on the committee. It was proposed “to make an enquiry as concerns a Room for the deposit of books…” From April, lectures were arranged and held in the Town Hall in the High Street. Further lectures followed quickly, with two being given by a Mr Scott of Berkhamsted on Astronomy during October of the same year. All this was achieved in spite of the Institutes locally being accused as “hotbeds of infidelity”. However, the Rules precluded the discussion of “politics and controversial divinity”. From that time the movement flourished, with lectures in prominent local buildings becoming common practice. 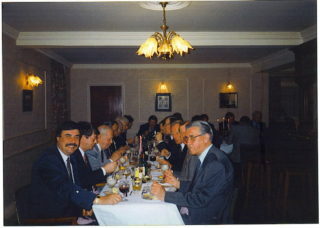 Further Institutes were formed in the district, e.g. Berkhamsted, Tring, Kings Langley and Potten End. Boxmoor also had its Parish Reading Room, now the Boxmoor Social Club in Horsecroft Road. 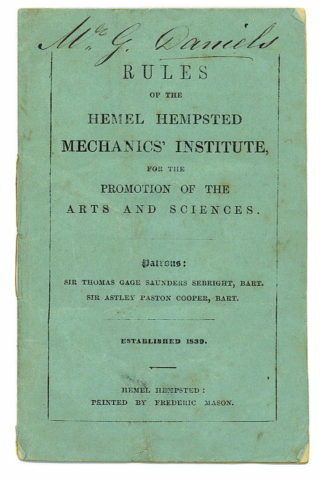 Lectures by the Gilchrist Trustees at the Hemel Hempstead Institute could only be given when connected to the establishment of a free library. This led to a discussion as to the desirability of procuring such a resource in the town. Mr Stallon thought it would not require a rate of more than a halfpenny in the pound. Public libraries were already in existence at Hertford, St Albans and Watford. The High Bailiff was asked to convene a meeting to consider the proposal. The County Library Service was inaugurated on 28 February 1925 and a mobile library served the area from 1926. Hemel Hempstead Library opened at its present location on 4 September 1957, as part of the New Town development. Dacorum College opened in the Marlowes in May 1963, ensuring continuation of the principle of adult education. 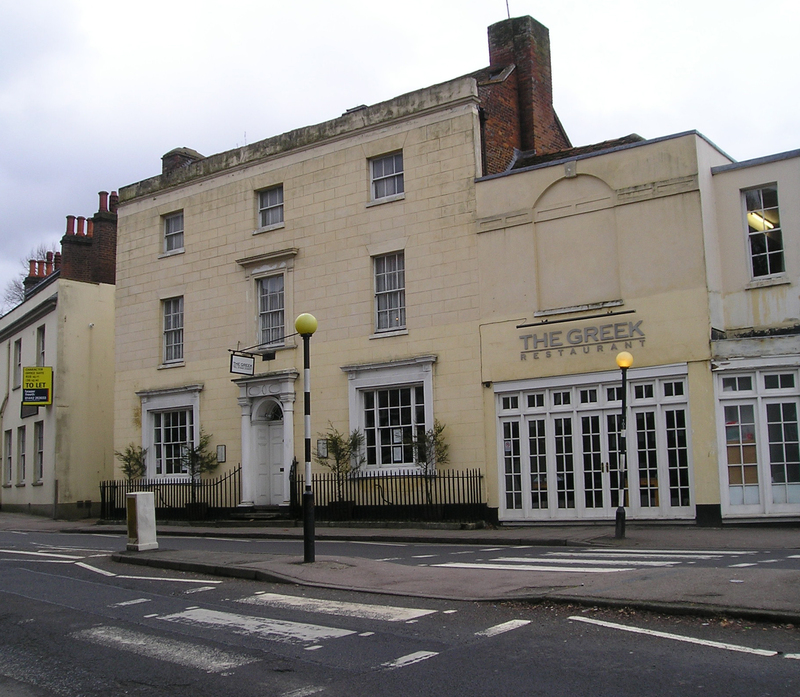 It had a branch in Berkhamsted’s High Street. 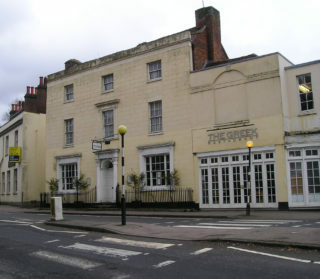 The Hemel Hempstead Club and Institute still exists today, on the corner of Queensway and Marlowes above the Greek restaurant, which premises it owns. 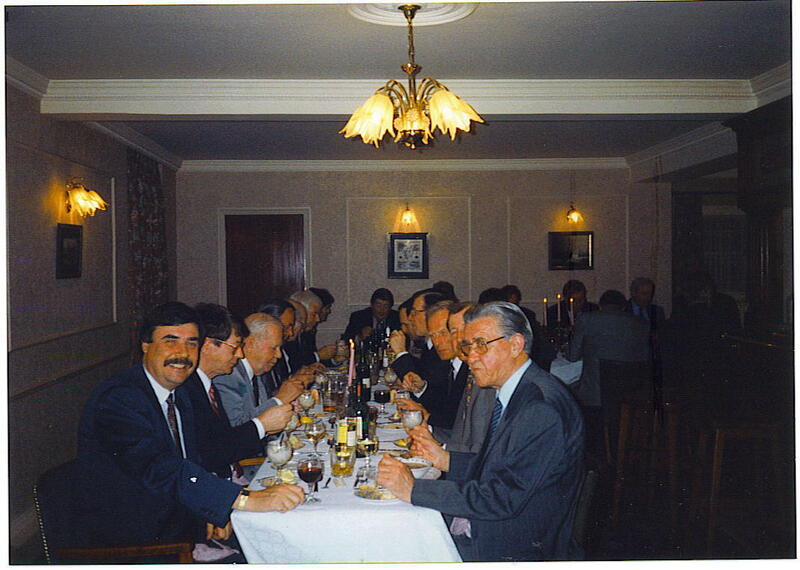 It is now more of a social club and has three fine snooker tables and a bar, with facilities for evening meals. It also has a modest library, in accordance with its original aims.